Bab e Salam (gate no. 1) is one of the major gates of Masjid al-Nabawi, and is located on the wetern side of the Rawda e Rasool. Originally built by Caliph Omar circa 640 CE (18 Hj.) in the western wall of the mosque. During the various extensions of the mosque, this door was also moved westward in the same line and today it is not in its original location. 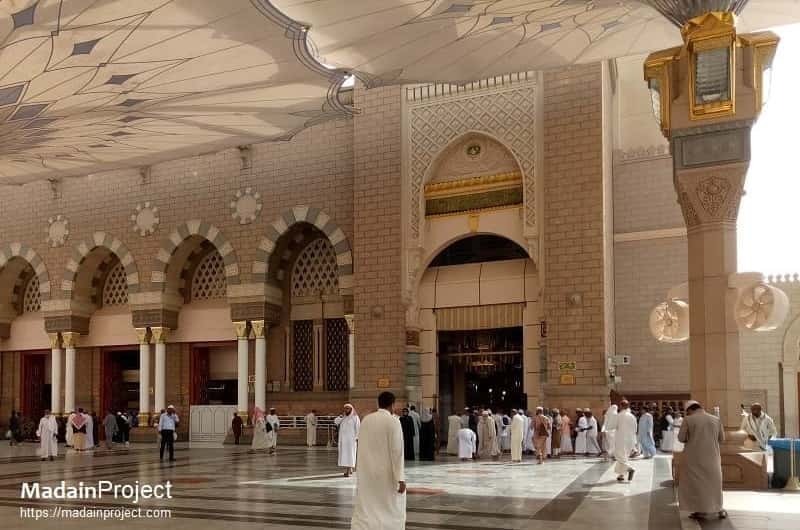 Modern and most recent construction of the as-Salaam gate of prophet's mosque took place during the first Saudi expansion, which was originally conceived by Shah Abdulaziz al-Saud and commissioned by his son Saud bin Abdulaziz. 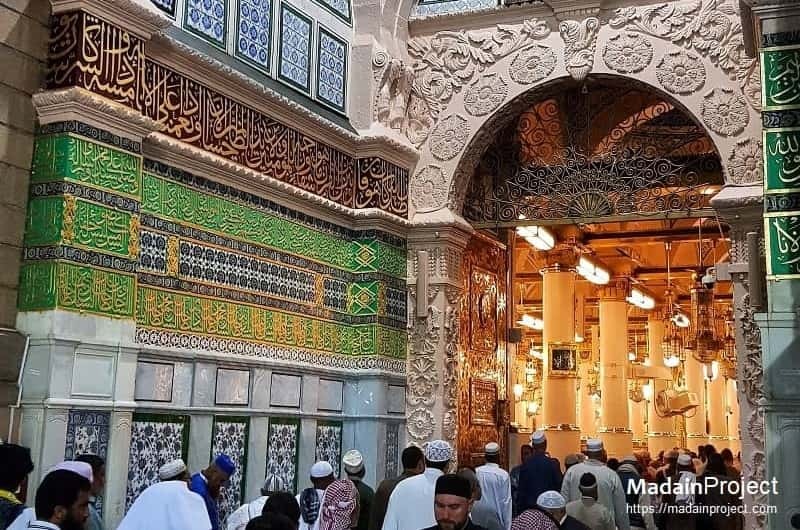 The small three portals to the left belong to the Bab e abi Bakr al-Siddique. Calligraphic inscriptions inside the Bab as-Salaam of Masjid al-Nabawi. The evolution of bab as-Salam (Bab as-Salam) from 1920s (left), 1950s (center), 1980s (right), gate no. 1, is the main gate of al-Masjid al-Nabawi, the prophet's mosque in Madinah, Saudi Arabia. The modern Bab-as-salam retaines few of the features of it's predecessor, although the exterior dome no longer exists the interior of the rood is still domed. The floral patterned lintel above the old door was also retained in it's successor. Today a chandelier hangs in the doorway. Panoramic view of the western flank of Masjid al-Nabawi, with Bab as-Salam (right) below the illuminated minaret, to the far left is the Bab al-Rehmah and the smaller tripple gate between the two is Bab-i abi-Bakr. Next picture (below) shows the same view from a bit more distance, as the gate stood during the first quarter of the twentieth century CE. The Bab as-Salaam minaret is the oldest and shortest of all minarets of the prophet's mosque. It dates back to the Ottoman period and displays ottoman architectural features. Street view of Bab as-Salam Gate circa 1930s, with the Ottoman era bab as-Salam Minaret (مئذنة باب السلام) to the right. The bab as-Salam is also visible near the base of the minaret, the small domed structure. 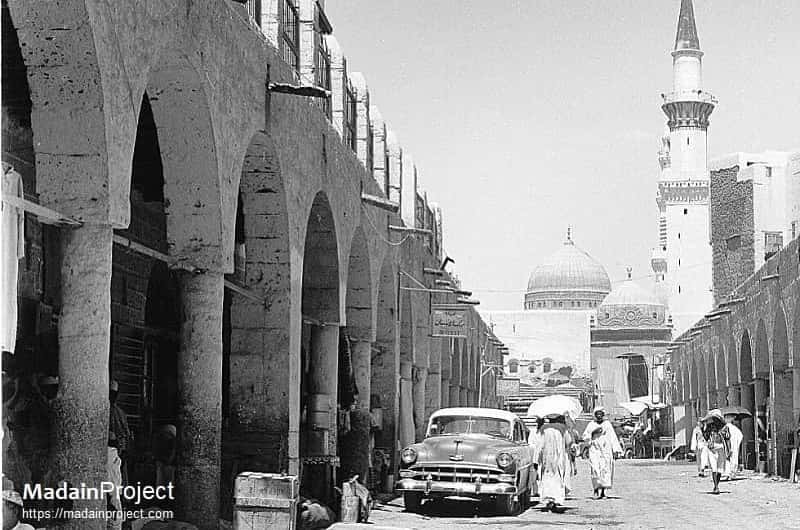 The large dome behind the bab-as-salam is the Green dome of the prophet Muhammad's tomb. The interior of the peace gate, this gate is directly inline with the Bab al-Baqi on the eastern end of the mosque near the Rawda. The two gates, Bab as-Salaam and Bab e Baqi mark the two extreme ends of the first Saudi expansion/reconstruction of the prophet's mosque circa, 1950/52 CE. During specific times of the year, like Ramadan, Hajj etc, this area sees extreme foot traffic of pilgrims, trying to approach the prophet's tomb.